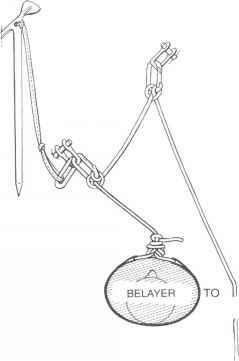 A standard anchor set-up for an ice belay takes two ice screws. Place the first screw in the ice in front of you, a bit to one side, at about waist to chest level. Clip in a carabiner and tie into it with the climbing rope as it comes from your seat harness. Use a clove hitch or figure-8 knot. Unclip from the hand tool that was placed as a temporary anchor and replant that tool above and to the outside of the ice screw. Clip the tool to the screw (via the wrist leash or a runner) as a backup to the anchor. Then tell your bclayer down below that you are off belay. Fig. 14-41. Anchor set-up for an ice belay above you and about 2 or 3 feet higher than the first one. 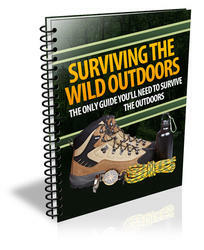 Extend the climbing rope from the first screw to the second screw and tie in with a clove hitch. There should be little or no slack between the two screws. This completes the anchor set-up (fig. 14-41). The next step in establishing your belay is to clip another carabiner into the second ice screw and clip the belay rope through the carabiner. This directs the pull from the climber through this screw. And after the follower ascends to the belay station and starts upward to take the lead, that screw becomes the first piece of protection on the new pitch. How to set up ice anchors and belays?